Have you been looking for a neat way to share your family history research? Have you ever thought about trying digital scrapbooking? Do you need some encouragement? Join us as we progress through the Family History Album class from JessicaSprague.com. The finished product is an album about three generations; parents, grandparents and great grandparents. Our assignment this week was to use the discount to purchase the class, download the content, check our software, gather information, create our title page and blog about our results. Because my wedding is on my mind, my book will begin with my husband and me and will be geared toward my children, but your book can begin with any couple you wish. 1. Choose new paper. Click file, open, navigate to the papers in the kit, double click the paper. 2. Drag the new paper to your title page project. 3. In the layers panel on the right, drag the paper so that it is positioned right above the shape you would like to repaper. In this example I changed the long paper to a floral. 4. In the layers panel, click on the new paper, click on Layer (at the top) and click Create Clipping Mask. The new paper should now be covering or be clipped to the shape of the long paper. YouTube: YouTube is an excellent resource for free beginning tutorials. This one demonstrates using digital scrapbooking templates in Adobe Photoshop Elements. 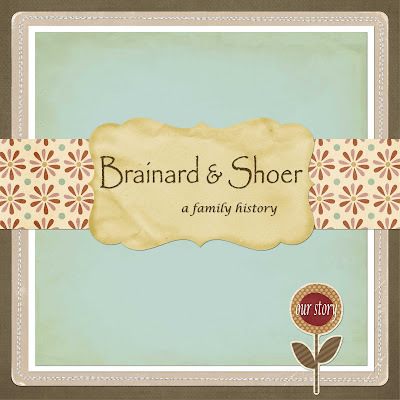 Family History Scrapbooking Page: What was your experience with making the title page? Was it hard for you or easy? Please let me know by posting your comments or questions below or on our Family History Scrapbooking page. It's never too late to participate in this project. Click on the Family History Scrapbooking tab to read all of the posts. If you would like to join us, post a comment or email me at jshoer [at] jenalygen [dot] com or Tweet me @scrappygen. Disclosure: I am not receiving any compensation from JessicaSprague.com. If you would like to get started, you can take a free class, Using Your Computer to Tell Your Stories: A Beginner's Guide. This great! Not only did you create a beautiful title page, but you gave the tutorial help I am needing, as this is only the 2nd page I have created digitally and the learning curve is steep! Thanks again! Glad the help was helpful. :) You are doing great Valerie. Tomorrow morning I will post for our week 2, day 4: family tree and pedigree chart. I have created my title page. I use Paint Shop Pro X3 which works a bit differently than Photoshop or Elements but I have been able to get it the way that I want it. Now on to lesson 4! Jen--I am posting my title page on Sunday. Is there someplace to link it?